ISLAMABAD: Although the PTI government has set up the Federal Information Commission (FIC) to deal with complaints against the ministries and their subordinate departments denying public their lawful right to seek information, the commission itself has assumed the status of a complainant. It has neither been allocated the staff required to start work nor given the proper office whereas the information commissioners who are to decide complaints have been denied salary since its inception. In November 2018, the PTI government notified an appellant body, the FIC, to address the grievances of citizens whose information requests filed under Right of Access to Information Act 2017 are denied by public sector entities. A chief commissioner, Azam Khan, and two commissioners, Zahid Abdullah and Fawad Malik were also notified that month. Law requires them not to perform any other service during their three-year term in office. However, they have not been paid salary since they assumed the charge. Budget summary of the commission is still pending with the Ministry of Information and Broadcasting. The commissioners have been allocated the board room of the ministry’s academy as a ‘meeting place’ where there is neither any phone facility nor a photo-state machine at their disposal,let alone the staff, it has been learnt. The commission demanded staff of 56 people which has been cut to the half, nevertheless, it awaits the provision of that staff from the government. In the meanwhile, more than three dozen complaints have piled up with the commission against the government departments, it has been learnt, but their disposal is not possible in absence of staff and proper work place. Added to this is the non-approval of rules which will govern the functioning of the commission. A copy of drafted rules is also pending with the ministry. As The News contacted Secretary Information Shafqat Jalil for comments, he admitted the above-mentioned issues. He said he was working on budget summary and weighing different options for equipping the commission with the staff. The summary, I hope, should be approved within a week, he told The News. The secretary also acknowledged that the summary of draft rules has not been approved yet but will be done soon. 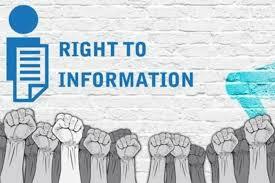 Right to Information (RTI) is a signature project of PTI. It introduced the law soon after forming the government in Khyber Pakhtunkhwa (KP) in 2013, a step which had a snow-balling effect in other provinces. Punjab followed KP the same year and Sindh five-year later. Baluchistan government is still oblivious towards the fundamental right of public to know about the functioning of the government. As PTI formed government at federal level after July 2018 elections, Prime Minister Imran Khan promised to ensure transparency through RTI law and wowed to introduce whistle blower legislation so as to encourage the insiders to point out irregularities in the government departments. This radical promise is in contrast with slow-motion progress on the proper enactment of the RTI law. Although federal government had an RTI law enforced in 2002, the first country in South Asia to do so, it was a toothless legislation as heavy exemptions were granted to the government departments allowing them to refuse information at will. This blockade was further facilitated through an ineffective appellant body, Federal Ombudsman, as it lacked judicial powers to enforce its directives. The work on new law had been in progress since the PPP government (2008-13), however, it was translated into action only a month before the end of the PML-N government when Right of Access to Information Act 2017 was passed from the Parliament in order to replace the Freedom of Information Ordinance 2002.